With the Fightboard Advanced, Revoltec presents an innovative keyboard that has been specially developed for use with computer games. The Fightboard has interchangeable Fightkeys, which contribute to optimising game control. The standard movement keys (QWERASD) can easily be replaced using the key remover tool provided. 11 hotkeys are located in the upper area of the keyboard, which make it possible to control multimedia and Windows? applications directly. The pad lock key implemented for the "Windows? key" prevents unwanted access to the task bar during play. 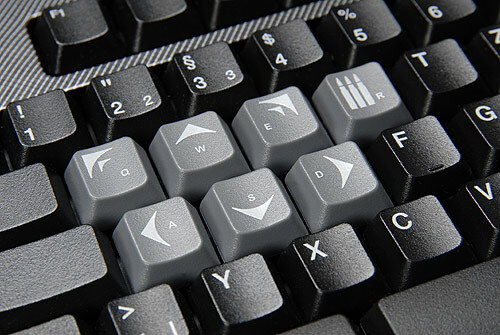 There are five additional macro keys of the left-hand and right-hand sides of the keyboard, which can be allocated to any key combinations, text sequences and mouse movements. - The software included in the scope of delivery offers extensive possibilities for configuring the macro keys.